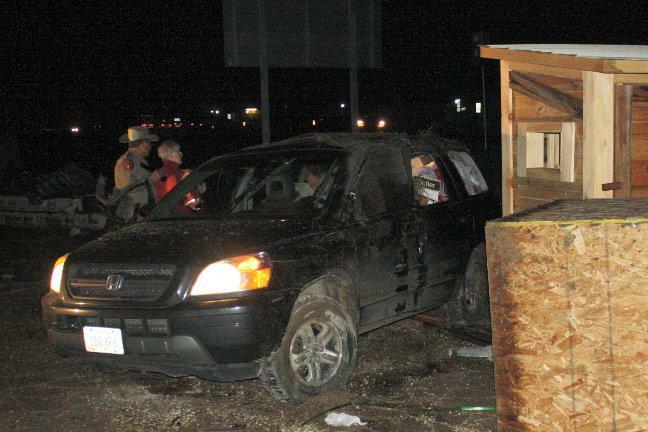 Driver Rolls SUV Multiple Times, GOODRICH, December 15, 2009 - At approximately 10:03 pm on December 14, 2009, a black late model Honda Pilot driven by Charles Stover, 71, of Indianola, Iowa, was south-bound on US-59 in Goodrich when, due to bad road conditions related to the weather, Stover's vehicle hit a slick spot on the road and left the road to the left. Stover over-corrected and shot across the road to the right side of 59 and left the road. When his vehicle hit the grass it rolled at least 3 times, striking some lumber that was stacked in the parking area of a local home construction business. 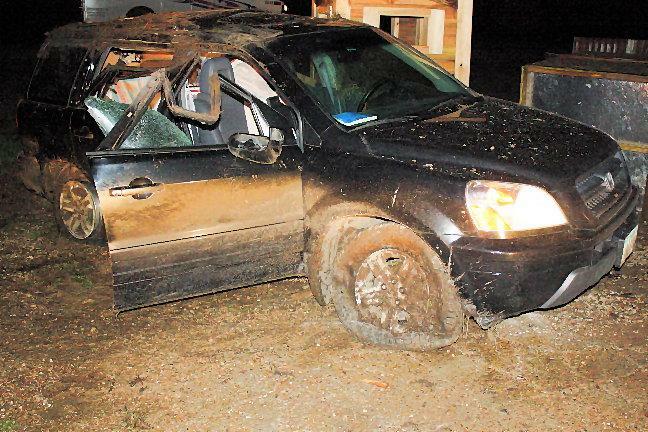 The vehicle tumbled over the equipment and slammed into some deer stands that were sitting in the vicinity. 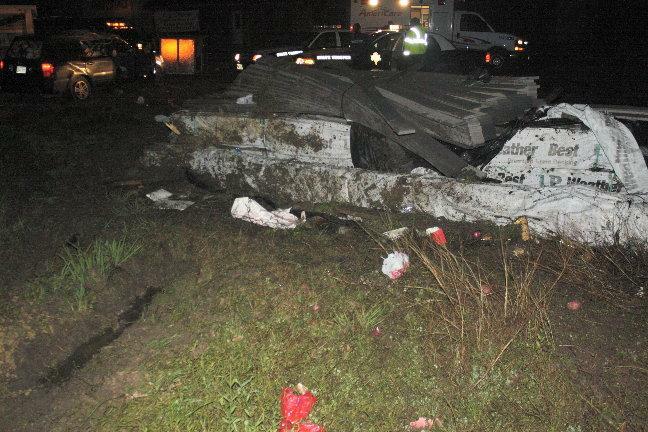 The vehicle came to rest upright. DPS Troopers Darwon Evans and Kevin Burman were dispatched to the scene along with Americare Ambulance Service. Amazingly, Stover nor his wife Virginia (or their puppy, Honey) sustained serious injuries. Traffic was not blocked during investigation and cleanup. Charles Stover was treated by EMS personnel from Americare at the scene but was not hospitalized. The Stovers did have insurance and no citations were issued. A rollback wrecker from Harwood Wrecker Service recovered Stover's vehicle. The scene was cleared a short time later. 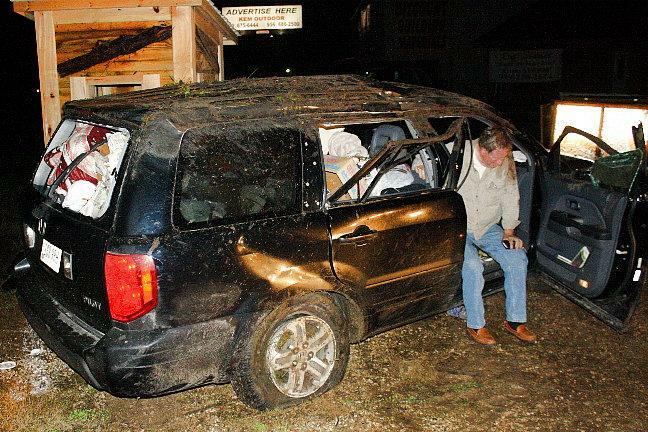 Charles Stover's Honda Pilot slammed into some deer stands. The SUV hit this lumber first, tumbled OVER the lumber, and then slammed into the deer stands (coming to rest upright). Amazingly, Charles Stover was shaken up, but physically okay. DPS Trooper Darwon Evans assists the Stovers, and investigates the accident. 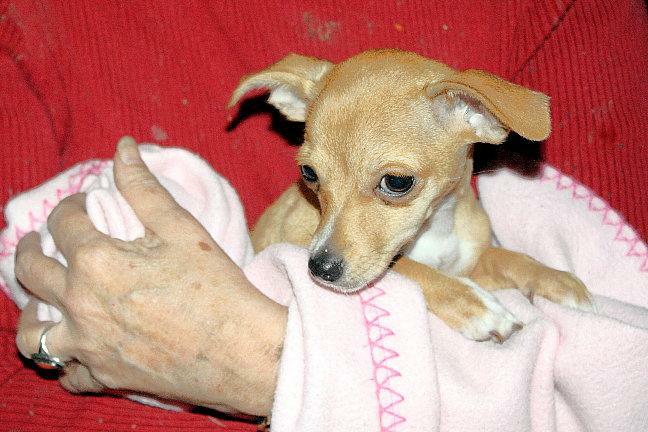 Virgina Stover cradles their puppy "Honey" who also survived the accident.